There is no better finish to a quality boat than teak decks, and at TLC we can custom design and build a genuine hand made teak deck to traditional designs, your own design, or why not leave the layout to our experienced craftspeople. 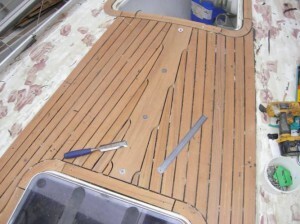 Before carrying out any work, we first thoroughly inspect the existing deck to ensure it is sound. 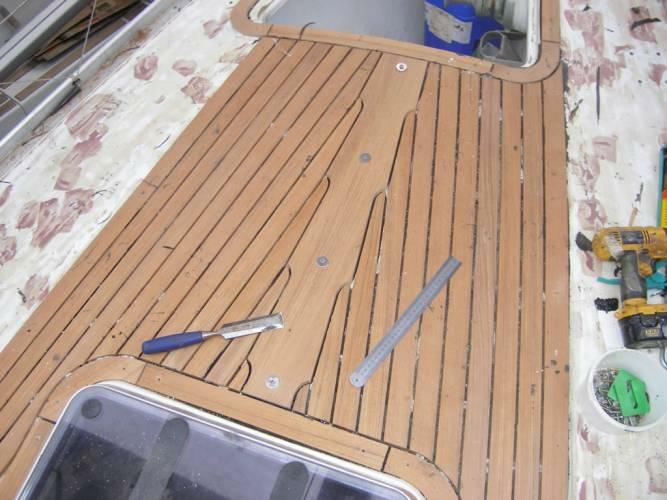 We secure each individual plank in place with black Sikaflex to ensure that the deck moves with your boat and does not damage the underlying deck. Upon completion we perform a full inspection to ensure that the work has been carried out to our famous TLC quality, and that your new teak deck is ready for you to enjoy. We use only the finest materials, we do not use remoulded or plastic teak deck kits, and our wood is all sourced from sustainable, responsible sources. If you would like to read more, please take a look at our supplier’s website, Robbins Timber – they take great pride in ensuring all their wood is not only of the highest quality but also has exemplary green credentials. Words can only go so far, so please see below for examples of our latest teak deck work. Many of these articles include testimonials from our clients, so you don’t have to take our word for it!